about a month ago i spent four days at IMAGING USA…its a convention for professional photographers… i knew that i would be in ‘class’ most of the time… and while i did walk away with some great business ideas and tips to make Dolce grow this next year…. 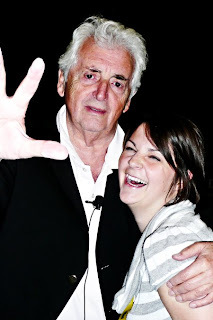 the highlight of my time there was not only getting to hear the famed Harry Benson speak, but to also meet him…and get a hug!! i had studied this amazing man in college and to actually get to meet him was unreal! he is so genuine and real… he showed pictures that he had taken over his 50 year career in photojournalism and told the stories behind them… he was there with Martin Luther King Jr on the Civil Rights Marches, he was within inches of Bobby Kennedy when he was assisnated (he bent down to change his roll of film and when he stood back up, five others around him had been shot…) …and of course he photographed the Beatles…which is probably what he is most famous for! so…yea i am rambling like a star crazed fan… it was an unforgettable moment in my life… here is a picture of us…yes, i told you i was starstuck..